Fruit storage can be tricky. If you're on a healthy raw food diet, you may have over a hundred pounds of fruits and vegetables in your house, and if not, then you've still got to figure out how to ripen and store fruit properly. With fruit being the major part of my diet, I've got quite a bit of experience in this. When I first went raw I fumbled around, with much of my fruit ripening too quick or too slow for my needs. I didn't know why some of my bananas were going mushy on me. It took me awhile, but I figured out the answers, so I hope this guide helps out a few new raw foodists. The warmer the spot, the faster fruit will ripen. I use my utility closet, which is always warmer than the rest of my apartment, as a fruit ripening closet. The higher the spot, the faster the fruit will ripen I've actually used staircases to great effect with this. Put bunches of bananas on each step, and the higher ones will likely be ready first. So you've got a 40-pound box of pea-green bananas that will stay unripe for days and then suddenly all get ripe at once? Spread them out so you can spread out the meals. Stuff some someplace cold. When I last lived in a house the basement was always the coldest part of the house, and a great place to put some fruit I didn't want to ripen quickly. And some in a warm spot like the aforementioned utility closet or in the sunshine. Place some in well-ventilated areas, others in enclosed spaces. Many fruit release ethylene gas during the ripening process. If you allow it to build up in an enclosed space, fruits will ripen faster. If you put fruit outside, say on a porch, they'll ripen slower. Things like apples will likely be perfectly ripe when they're picked off the tree, and other fruit simply get ripe before you want to eat them. Stick them in the fridge to keep them good longer. If you can get away with it, keep all fruit out of the fridge. There are exceptions, but often the taste of fruit declines in the cold. Apples will stay good a very long time in the fridge, with little or no drop in taste. Watermelon will likely be ripe when you buy them, but I've kept them at room temperature for up to 2 weeks with no ill effects. Obviously, once you crack them open you should put the remainder in the fridge. Chilled watermelon is delicious. Never put green bananas in the fridge, but once they're very ripe you can likely get another week out of them in a refrigerator. The skin may turn black in the cold, but the flesh will still be fine, with little taste deterioration. I've found that cantaloupes decline after more than a day or two in the fridge. Tomatoes should never be put in the fridge They'll last a week or eight days on the counter after getting red, and really shouldn't be kept longer than that. The tart taste of tomatoes is due to a chemical called Linolenic Acid converting to Z-3-Hexenel, and this reaction is disrupted by cold, so keep them at room temperature. 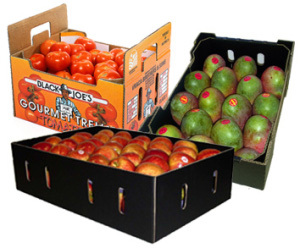 A major concern with storing fruit is dampness. Don't let fruit get wet or your fruit will go bad. When bananas have become mostly yellow, leaving them inside the plastic bags they sometimes come in can lead to the accumulation of moisture in some conditions, so it's best to take them out of the plastic bags before this. The other element is bruising. Some fruit, like tomatoes, are very easily bruised. A bruised section will quickly turn black and go bad, which can draw fruit flies and generally just ruin the fruit. Learn other good fruit storage, ripening, and fruit fly prevention info here. 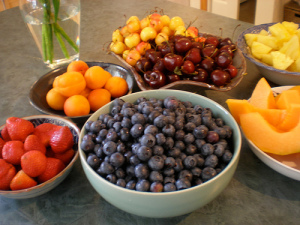 Also, you can learn how to use this fruit storage info to make these amazing raw food recipes.